Although the notion of religious freedom is embodied in Israel’s Declaration of Independence, that principle has generally not been translated into equal rights and religious pluralism. Orthodoxy enjoys monopolistic powers in a variety of fields such as marriage and divorce registration, municipal religious councils, the operation of religious Jewish day schools and kashrut supervision. It appoints Israel’s chief rabbis and municipal rabbis, who are state-funded, controls religious sites such as the Western Wall, and provides the chaplains that serve in the Israel Defence Forces, hospitals, public institutions and elsewhere. The list is endless. Most of the Reform synagogues in Israel were only built following difficult and exhausting struggles against city councils, who in many cases only agreed to allocate land to congregations following being threatened with litigation. Hod Hasharon is no exception. Several years ago, Kehilat Yonatan’s Rabbi, himself a bereaved father, had the right withdrawn to recite the memorial prayer at the municipal event to mark Memorial Day when antagonists threatened to disrupt the event and destroy the amplification system. Letters of protest were sent to the mayor from all over the world, including from the leaders of Jewish Federations in the U.S.A and all religious streams in the Diaspora. Hundreds of letters were sent to the town’s leaders from Israel and overseas. 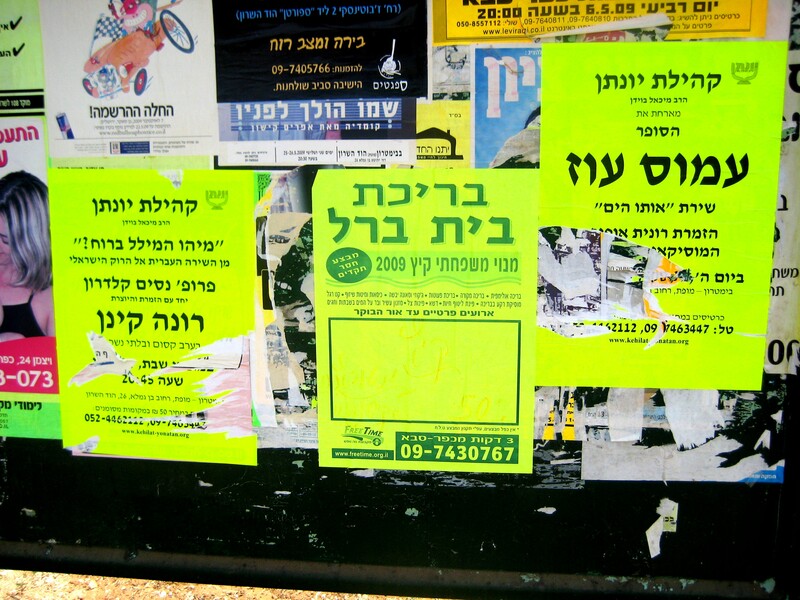 Kehilat Yonatan is also the victim of vilification in the local press by Orthodox circles, suffers from the defacement of billboards on which its activities are advertised (see photo), and faces unequal treatment by the town in the allocation of financial resources for its activities in comparison with those granted to Orthodox circles. Although Kehilat Yonatan numbers some 1,500 households, it has no permanent home of its own and is forced to wander from one hall to another in the town without any certainty as to its future – this in a town in which there are no less than 60 Orthodox synagogues. Nevertheless, Israelis are voting with their feet! Large numbers of families turn to Rabbi Boyden to officiate at their lifecycle celebrations such as Bar/Bat Mitzvah and weddings. On the festivals, such as Rosh Hashanah, Yom Kippur, Sukkot, Simchat Torah and the like the building we use is full to overflowing. Kehilat Yonatan’s Study Center offers lecture series on a wide range of Jewish/Israeli cultural themes , which are attended by large numbers of people seeking enrichment in a non-coersive environment. (See the lecture series.) Likewise, annual courses in Talmud, mysticism and the like are heavily subscribed and greatly enjoyed. Following appeals to Israel’s Supreme Court, Reform conversions are now recognized by the State of Israel. After a struggle lasting more than a decade, city hall has finally agreed to allocate land to Kehilat Yonatan for the building of a synagogue and center for Israeli/Jewish education and culture. Building an institution like ours is to create facts on the ground in a country desperately in need of religious alternatives for the vast number of Israelis in search of their Jewish identity. The greatest challenge facing liberal Jewish streams in Israel and throughout the world is to advance religious pluralism in Israel and offer everyone an enlightened and open Jewish alternative.